This drill will help you with correct arm rotation through the golf ball. 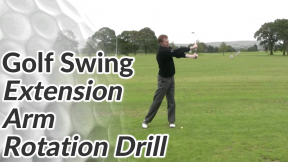 If you’ve jumped straight to this drill, please see the extension and rotation lesson first. Extending and rotating correctly through the golf ball is something that a lot of club players struggle with. It costs them both power and accuracy. 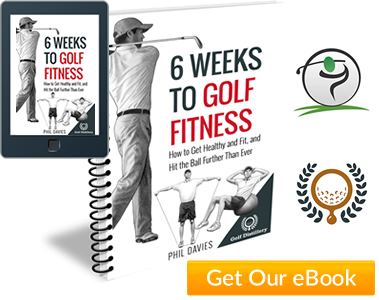 In fact, learning to rotate your arms and hands fully is a great way to generate extra power and distance without any extra exertion in the swing. 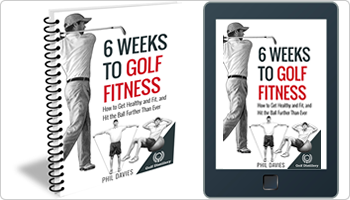 Take your grip on the golf club as normal but then slide your bottom hand (right hand for the right handed golfer) down the club so it’s gripping the club shaft one hand’s width below the bottom of the grip. Make a shortened backswing making sure the left arm stays straight and then swing through to a follow through position and hold. In that completed position both arms should be straight and fully extended. You will notice a very aggressive crossover or rotation of the hands during the swing. The rotation is exaggerated in this drill because the right hand (which is gripping right down the shaft) has to travel much further, and so much faster, than the left hand. 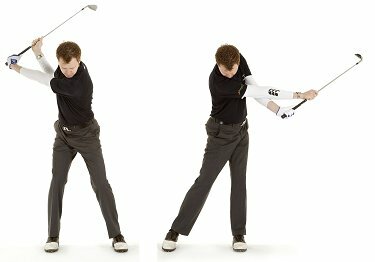 Make half a dozen swings with your hands split like this and then slide your bottom hand up a few inches. Make some more swings replicating that rotational feeling. Repeat the process – each time sliding your right hand up the club until you are taking a normal grip.